Draco Malfoy and the slimy kids of Slytherin couldn’t have wreaked more damage on Harry Potter than a bunch of commando guinea pigs did to Harry Potter and the Half-Blood Prince this weekend. G-Force, the live-action and CGI action comedy, earned $32.2 million this weekend at the North American box office, besting the $30 million take of the sixth Potter film, according to the usual movie-studio estimates of the weekend frame. Final numbers are posted Monday. G-Force was one more win for uber-producer Jerry Bruckheimer, supreme entrepreneur of movie pirates and car-crash films and a slew of chalk-outline TV hits. His notion of The Dirty Dozen for rodents corralled the kid audience, luring them from a first or second look at the latest Hogwarts adventure. Half-Blood dropped a precipitous 61% from its opening Friday-to-Sunday engagement, as if the vast army of Harryphiles had belatedly discovered that the new Defense of the Dark Arts teacher was Bruno. Top finisher among films with non-wizard human beings was The Ugly Truth, the R-rated Katherine Heigl-Gerard Butler romantic comedy that survived libelous reviews to earn a perky $27 million. If the figures hold through the next few weeks, Heigl will have joined Sandra Bullock as the rare female star who can deliver large crowds to really crappy movies. Finishing the weekend just behind The Ugly Truth, but with less than half its take, was the adopted-child horror film The Orphan. Cruising along were Ice Age: Dawn of the Dinosaurs and Transformers: Revenge of the Fallen, in fifth and sixth place. The rampaging-bots movie has earned $379.1 million so far in North America, more than twice what the woolly cartoon has amassed; but Ice Age 3 is mammoth abroad, taking in nearly a half-billion dollars and outgrossing Transformers 2, though it opened a week later. 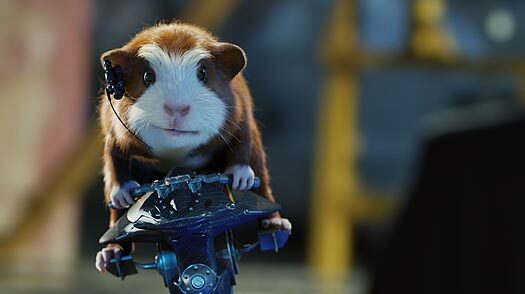 The G-Force ads read, “Gadgets, Gizmos, Guinea Pigs. In 3-D.” And the difference between the top two films may have been the surcharge audiences pay to see a movie while wearing goggles. G-Force played in 1,600 IMAX theaters, Half-Blood in just three . Potter’s IMAX number increases to 164 on Wednesday, and with many fans likely to return for the full-screen experience, you can expect a much more modest drop next week. In indie rom-com business, the sentimentally schadenfreude Days of Summer expanded to 85 theaters and finished 11th with $1.6 million and a passionate $19,000 per-screen average; Woody Allen’s alterkocker altercation Whatever Works pushed over the $4 million mark in its sixth week; the smug-alert road movie Away We Go inched near $9 million in its eighth; and the Jeff Daniels crabby-guru valentine The Answer Man was D.O.A., opening to a lame $13,000 on six screens. As for the two critically acclaimed, otherwise very different Iraq-related movies, the war film The Hurt Locker has hit $4 million in five weeks of limited release, and the new In the Loop, a salubriously savage comedy about the Anglo-American ramp-up to the war, cadged a shock-and-awe $200,000 at just eight theaters.